Have you even gone looking for one poem and discovered a new-to-you poet in the process? That’s how I found “Driving at Night,” by Sheila Packa. I instantly fell in love with Packa’s evocation of Sunday drives. Suddenly, I was in the back seat of my mother’s Chevy, watching the world go by. Be sure to visit Katya Czaja at Write. Sketch. Repeat. 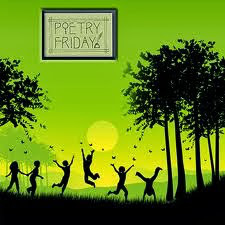 for the Poetry Friday Round Up. Oh, thanks for sharing this poem and sending me on a trip down memory lane. I so clearly recall lying in the back seat of the big station wagon, eyes closed, trying to judge by the twists and turns in the road when we were in familiar territory and close to home. I do remember those drives at night when we were thought to be asleep in the back seat, but I was listening to my parents’ quiet conversation and feeling the comfort of belonging. Thanks. I enjoyed this poem–especially those final lines. Brings back memories of car rides “up north.” Thanks for sharing this! Beautiful poem– one so many of us can relate to despite the “Finnish brogue.” Thanks for sharing your newest poet discovery, Catherine! Lovely poem, stirs up such great memories. Jama took my favorite line, gorgeous: “It’s like a different country, the past”. I wonder what kids today will remember. I loved the cozy feeling driving home at night with parents in the front. Thanks for sharing this new poet, too, Catherine. Yes, this brings back memories of Sunday drives, of Christmas Eve drives around town looking at lights, of watching shooting stars out the back window of a friend’s car as we drove home from a high school basketball game. Thanks for the introduction to Packa’s poem, Catherine. I love Sunday drives with my family growing up, too.